Gastric Bypass Roux-en-Y reduces the capacity of the stomach by creating a small stomach pouch. The small space holds only one ounce of fluid. The procedure also constructs a tiny stomach outlet, which slows the speed by which food leaves your stomach. So you will feel full after eating a small amount and you will stay satisfied for a long time. According to the American Society for Bariatric Surgery (ASBS) and the United States National Institutes of Health (NIH), Roux-en-Y gastric bypass is the current gold standard procedure for modern weight loss surgery. It is also one of the most frequently performed weight loss procedures in the United States. Most of the stomach and a variable length of small intestine are bypassed thus combining both restrictive and malabsorptive components. What is Gastric Bypass Roux-en-Y ? » Staples are used to create a small (15 to 20cc) stomach pouch across the top part of the stomach (just below the point where esophagus joins). » The rest of the stomach is not removed, but is stapled completely shut and divided from the stomach pouch. Food will not enter this part of the stomach (which is bypassed). 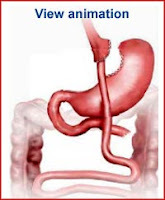 » In order for the food to pass into the small intestine from the pouch, the small intestine (jejunum) is divided 50 cms beyond the duodenum, brought up, and connected to the newly formed stomach pouch. The opening from the pouch to the small intestine is small so as to delay emptying of the pouch. » The newly formed pouch empties directly into the lower portion of the intestine bypassing calorie absorption. » The other end of the jejunum is connected into the side of the pouch limb of the intestine 75 to 150 cms away from its cut end (creating the "Y" shape that gives the technique its name). How does the Gastric Bypass surgery work ? It is easier to understand how the gastric bypass surgery works once you understand how the digestive system works. The mouth and teeth are used to grind and chew our foods before swallowing. When we swallow, food passes through the esophagus into the stomach. It is in the stomach where preliminary digestion takes place. This occurs in two ways. First, the stomach helps to grind the food to paste. Also present in the stomach are digestive juices and acid. These digestive juices begin “preliminary” digestion of carbohydrates, proteins and fats turning the food into a paste called chyme. The chyme then passes slowly into the small intestine. In the small intestine foods are fully digested. Small particles of food called sugars, amino acids and triglycerides are then absorbed across the intestinal wall into the blood stream. Vitamins and minerals are also absorbed from the small intestine. Undigested food, such as fiber and other body waste products, then pass along to the large intestine where they are made into solid waste and excreted from the body. Gastric Bypass surgery is designed to help with weight loss both by restrictive and malabsorptive means. The small stomach pouch initially will only hold one to two ounces of food at a time. Once the pouch is full, it takes about ten or more minutes for food to pass through to the small intestine. This gives a feeling of early satiety after consuming small amount of food It will take, on average, 30 to 45 minutes to eat a meal consisting of two ounces of meat and one-fourth cup each of a starch, vegetable, and fruit. Therefore one stays satisfied for a longer time after meal. In addition, the pouch is now too small to help grind foods for you. Only small amounts of digestive juices will be present to turn foods into a paste. This means you will have to thoroughly chew all foods to a baby food consistency before swallowing. Otherwise, the food will be too bulky to pass from the pouch through the opening to the small intestine. Failure to chew foods will result in pain or discomfort and possibly vomiting. The time it takes to chew foods thoroughly and the limited space in the stomach pouch reduces the amount of food you are able to consume at a meal time. This will cut down on the amount of calories you consume at a given meal, which in turn will help with weight loss. With the intestinal tract sewn directly to the stomach pouch, liquid food will now flow uncontrolled from the stomach to the intestine. Sugar, which is already in its fully digested form, is rapidly absorbed across the intestinal tract into the blood stream. If the food you eat contains sugar, you will experience "dumping syndrome". You body's response to consuming too much sugar is to break into a cold sweat, nausea, and possibly vomiting, diarrhea, and overall weakness. This feeling will last for approximately 20-30 minutes. Once this has happened, most people are careful not to consume foods high in sugar. Foods high in sugar are also high in calories. Many foods high in sugar are also high in fat, therefore, high in calories. Eliminating sweets and fats from your diet will help with weight loss. Since gastric Bypass surgery involves reshaping the stomach and small intestine, the food in the gastric pouch and food channel cannot mix with digestive juices till the junction of the digestive juice channel. Therefore little digestion occurs in the stomach and the food channel thereby limiting absorption of calories and nutrients. In review, the Gastric Bypass surgery simply forces the same behavior modification that are found in any sensible diet program: eat three meals a day, eat small portions, eat more slowly, and avoid high calorie foods and when satiety is reached, stop eating. The difference being, with surgery, after the first 20 to 30 pounds of weight loss, you cannot decide to forget about dieting. Surgery is permanent. Therefore, unlike other methods of weight reduction, because of the surgical modifications made to your digestive system, you stay with the diet for the rest of your life. “Dumping syndrome” helps alleviate the “craving” for sweets and desserts. The advantages to performing the Gastric Bypass Laparoscopically are that it yields cosmetically superior results and the recovery is faster. Some long-term problems of open surgery, such as incisional hernias and wound infections, also occur less frequently. However, sometimes because of difficulty in visualization, the operation must be converted to an open procedure in order to complete the operation safely. This decision, of course, is made during the course of the operation while the patient is under anesthesia, so the patient must be aware of this possibility before the surgery starts. Another disadvantage is that the incidence of leakage from the surgical staple lines may be more common in the postoperative period. Leakage from the staple line is a serious complication and often necessitates additional surgery, usually using a traditional incision, and prolonged hospitalization, and sometimes even death. » After gastric bypass surgery, weight loss is more predictable and usually maintained. Average excess weight loss is usually higher than with purely restrictive procedures. » One year after surgery, weight loss can average 65% to 70% of excess body weight. After 10 to 14 years, some patients have maintained 50-60% of excess body weight loss. » 96% of certain associated health conditions (back pain, sleep apnea, high blood pressure, diabetes and depression) were improved or resolved according to a 2000 study of 500 patients. It also helps in leg swelling, high cholesterol, urinary incontinence etc. While we take all measures to prevent complications, some are unavoidable. You must understand these risks in order to make an informed consent. » Bleeding : If a large amount of blood is lost, you may require a transfusion. The chances of your requiring blood transfusion are less than 4 percent. Rarely delayed bleeding may require re-surgery. » Lung problems: Anyone undergoing general anesthesia has a risk of having breathing problems. Excess weight places extra stress on the chest cavity and lungs. This means a greater risk of breathing problems and pneumonia developing after surgery. Stopping smoking four weeks before surgery, sitting up in the bed in the evening after surgery and performing breathing exercises will help in decreasing the risk. » Venous thrombosis or blood clots in the leg occur more often in obese. Smoking and hormone pills increase the risk. The clot can migrate to lungs causing Pulmonary Embolism. With this in mind, heparin therapy and compression stockings are used in all patients with surgery. The best way to reduce this risk is to exercise the leg muscles to promote blood flow. Walking is the best therapy to prevent blood clots, but even moving the feet and ankles up and down while lying in bed helps. » Leak at one of the staple lines in the stomach can occur in about 2 % of gastric bypass surgeries. Leakage of digestive juices and acid can cause peritonitis. This may necessitate an emergency surgery to stop or drain the leak. » Bowel obstructions may develop anytime after surgery. Most common causes are adhesions (scar formation) and internal herniation. It may require a repeat laparoscopy or sometimes even open surgery to relieve the obstruction. » Infections in the incision occur in about 2% of patients after laparoscopic gastric bypass surgery. These may sometime require drainage and regular dressings so that they heal from inside out. Occasionally, in a serious infection, a second surgery may be required. » Dumping syndrome. When stomach contents are literally "dumped" rapidly into the small intestine. Usually triggered by too much sugar or large amounts of food, dumping syndrome doesn't pose a health risk, but its symptoms aren't fun: nausea, weakness, sweating, faintness, and diarrhea. Some patients can prevent dumping syndrome by avoiding sweets after surgery. » Bowel problems. After surgery, there may be a period of intestinal adaptation during which bowel movements can be liquid and frequent. This bowel complaint, frequently accompanied by bloating, gas and foul smelling stools, may reduce with time. » Patients may develop gallstones after rapidly losing weight in about 30% of cases. The risk of gallstones can be reduced to 2% by taking bile salts for 6 months following surgery. » A hernia or weakness in the incision occurs in about 2 percent of patients after laparoscopic gastric bypass (15 percent after open weight-reduction surgery). This usually requires surgical repair, depending on the symptoms and the extent of the hernia. » Narrowing or "stricture" of the stoma (opening) between the stomach and intestine is a rare complication. When foods are not chewed properly and get stuck or have difficulty passing through the stoma, they cause scarring. When scarring occurs, it becomes more difficult for the food to pass. It is suspected when vomiting occurs most of the times after food. The stoma can be stretched by a gastro enterologist in the outpatient with a dilating tube that is passed to the stomach through the mouth (endoscopic dilatation). » An ulcer where the small intestine is attached to the upper part of the stomach. Ulcers may occur in 5 percent of people who have gastric bypass surgery. Ulcers are more common in people who take aspirin or other medications called non-steroidal anti-inflammatory agents (NSAIDs). » Nutrient deficiencies: Almost a third of patients develop nutritional deficiencies. Because the duodenum is bypassed in this procedure, the body cannot absorb iron, calcium and other nutrients efficiently after surgery. Fortunately, these deficiencies can usually be controlled with proper diet and vitamin supplements. Iron deficiency anemia. Because the duodenum is bypassed in this procedure, the body doesn't absorb iron and calcium very well after surgery, which can lead to iron deficiency anemia. This is a particular concern for patients who experience chronic blood loss during menstruation or from bleeding hemorrhoids. Taking a tablet daily of multivitamin and iron will prevent or reverse this process. Osteoporosis. Because the body doesn't absorb calcium properly after surgery, there is a greater risk of developing osteoporosis. Daily supplementations of calcium will prevent osteoporosis. Metabolic bone disease. Also caused by bypassing the duodenum, some patients experience bone pain, loss of height, humped back and fractures of the ribs and hip bones. Chronic anemia. A type of anemia caused by a deficiency of vitamin B12 can usually be managed with pills or injections, which will be taken life long. » Diminished effectiveness. The success of the procedure can be reduced if the stomach pouch is stretched by intake of large volumes of food regularly. Although gastric bypass surgery is a proven and effective way for morbidly obese patients to lose weight and keep it off, gastric bypass is a “tool”, not a “magic cure”. Recognizing and accepting this enables patients to use the gastric bypass to achieve the goals of weight loss and maintenance. With this sustained weight loss comes unlimited benefits, with the most important being improvement or complete elimination of medical problems related to obesity. Gastric Bypass surgery is effective in 85 percent of all people who have the surgery. Success means the individual must lose at least 50 percent of their excess body weight and maintain that weight loss for more than five years. Bear in mind, this also means that 15 percent of all people who have had Gastric Bypass surgery did not lose weight, or they lost weight but gained it back within five years. During the first year following surgery, the greatest amount of weight loss will occur. Losing the excess weight is only the first stage of your weight loss program. The most difficult years are ahead of you. Recognizing obesity as an addictive disease can help you better understand the emotional struggles you will be faced with as you lose weight. The underlying cause of overeating still needs to be addressed. In order to achieve these goals, patients are required to comply with a rigorous recovery, followed by lifetime changes in eating behavior. After gastric bypass patients are required to follow a two-week liquid diet, followed by a two-week pureed (blanderised) diet. Permanently eliminating concentrated sugar from the diet is also expected. Because the dumping syndrome will usually occur after eating sweets, the required elimination of these from the diet is easier to do for most patients. Any food that is liquid when it hits the stomach passes into the intestine easily. This is the reason to avoid liquids with calories like soft drinks, juices, Kool-Aid®, sweetened tea, etc. A single 12 oz soft drink per day for 365 days accounts for 17 pounds of fat calories over a year. Many of the junk foods are also primarily liquid by the time they hit the stomach. A single doughnut per day over a year produces 34 pounds of fat calories. High calorie foods such as cake, cookies, pie, chips, candy, etc. need to be avoided permanently. Obesity surgery doesn't mean that you don't have to diet anymore. What it means is that if you adhere to the prescribed diet for the rest of your life, you'll lose the weight and keep it off. If you ever go off the diet, you'll gradually begin to regain lost weight. We want you to implement this sort of diet before surgery. Weight loss before surgery helps the surgeon by making laparoscopic surgery easier and safer and increases the likelihood that your surgery can be performed laparoscopically. Other dietary requirements are basic ‘common sense’ eating. With sensible eating and exercise habits (three sensible meals a day with healthy snacks), the weight loss can be easily maintained after surgery. Exercise, though probably difficult for you now, should become part of your daily routine as you lose weight. With weight loss, patients have less joint pain, less shortness of breath, and more endurance. We encourage all patients to adopt an exercise regimen such as walking, swimming, aerobics, or any other form of physical fitness. This not only increases caloric expenditure, but metabolism as well, thus helping with weight loss and maintenance. We also suggest weight training since building muscle tissue (muscle tissue burns calories 24 hrs a day) increases and helps maintain maximum weight loss. In addition to changing eating behaviors, you also require lifetime vitamin supplementation, including multivitamin, iron, B12, and calcium. Occasionally, others (vitamins A, D, and/or E) are required as well. You need to monitor blood on a yearly basis to determine appropriate doses of these vitamins.